This photograph depicts the original John Wesley Church which once stood at what was then the corner of Oak and Maple Streets in Frostburg. Oak ran parallel to Park Avenue, which was then known as Lonaconing Street. 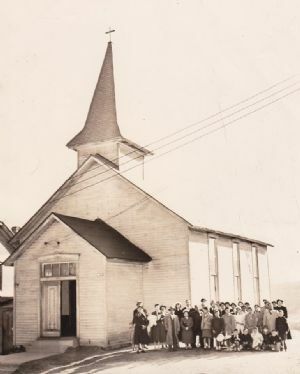 The church was part of what was known as the Brownsville community, and the photograph was taken prior to the state's acquisition of properties for the expansion of what is now Frostburg State University. Lowndes Hall now stands on this site. The history of Brownsville is described in detail elsewhere on this website. Photograph: From the "Remembering Carver" website.